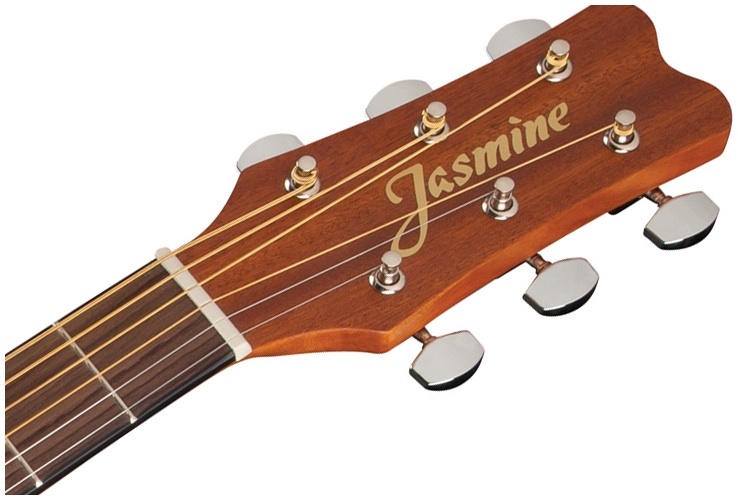 Jasmine S35 Guitar: It is one of the extremely affordable acoustic guitars are a category which is not popular. Most of the people have to save up for the better model. These guitars are a necessity and got many talented musicians started on their journey. The epitome of a cheap acoustic guitar and should look and should like and one of the most capable cheap guitars on the market right now and made it the choice of many new players out there. Jasmine S35 Guitar builds guitars to put them in the hands of the beginning players. It is the dreadnought with a different voice coming from the pine like wood that makes up the body. It has a neck that feels it should be the electric guitar. It is one of the company name for entry-level models that can build by the Jasmine. The Jasmine S35 Guitar company entry into the dreadnought body shape and an all laminate guitar. The top spruce with the advanced X-bracing. The sides and back made of the Agathis. It has the measurements and scales length of 648mm, i.e,25.5” making it a full-sized guitar. It has outlined with the black binding on the top of the body with the matching heel cap. The neck of the guitar is made up of Nato and also known as the eastern mahogany. The rosewood fingerboard has the 305mm, i.e.,12” radius. It coupled with the slim profile of the neck that makes the guitar feel very much like an electric guitar’s neck world. It has the 20 frets and pearloid dot inlays and an adjustable truss rod. The synthetic bone nut has a width of 44mm, i.e.,1-3/4”. The rosewood bridge has the compensated synthetic bone saddle. The strings anchored with the black plastic bridge pins and the rosette is made up of the concentric circles. It has the advanced X-bracing named for the fact, and the X part of the bracing shifted towards the soundhole. The wood of the guitar bracing is quartersawn and scalloped. A rosewood bridge plate also helps in transfer of the string vibration to the body of the instrument. The wood of the body of the guitar is Agathis, and it is the distant relative of pine. Agathis matches the tonal qualities of the pine very well and also has the added benefit of aging much better than pine. The softwood that will be strengthened by the laminate construction. The body has the satin finish, and the simple black pickguard stands vigilant against pick attacks to the body. No case included the guitar and the size and shape of the guitar will make it quite easy to find the case of your new guitar safe. It is the full sized instrument with the large dreadnought body shape and gives the loud voice and also could feel very overwhelming to the young or small framed player. The slim neck is the fastest and very playable. It feels good to the players with the little hands. I love noticed quite a bit of the concern in the user reviews about the build quality. The best way to assure the real instrument is to try it before you buy. If you do not know how to play yet and bring a friend to try it for you and also a good idea to have the store do a proper setup before you have to take the guitar home. You will happy for this attention to make the guitar the best. The Agathis brings out the midrange of the instrument without stomping on the other registers, and it has a sweet and warm sound that is different from the typical dreadnought given a wood choice. Sounds better fingerpicked and it does take a pick well which gives it more chime to the treble. A unique voice and with the Agathis wood. The Slim profile neck is very playable and fast. General concern about build quality. No case included in the price. The Jasmine S35 is an entry-level guitar that has the counts. It has an excellent sound coupled with a very playable neck. It helps the guitar that will get the new player up and sprint.